Home > Automotive Belts > Automotive V-Belts, Auto XL V-Belts. > RPF-3255 Automotive V Belt. BANDO RPF3255. RPF3420 Automotive V-Belt. 43” Effective Length (1102mm), 1/2” (.47”) Top Width, 36 degree angle. HC50 Section. 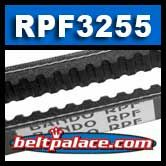 BANDO USA’s RPF-3420 Notched V-Belt for Automotive use.